Completely revised and updated, Ogre Miniatures, Second Edition takes the original book and incorporates all of the material from the 2008 Update, as well as new material from Ogre Sixth Edition, into a definitive ruleset for miniature play. Ogre Miniatures, released in 1992, is a 64-page full-color rulebook. It is fundamentally the same game as Ogre Designer's Edition, with hexes translated into inches and other adaptations for miniatures play. That's right – Ogre Sixth Edition and Ogre Designer's Edition can officially become miniatures games. These quality minis, sized to fit the current generation of Ogre products, provide the most immersive experience yet. Customize these unpainted miniatures and immerse yourself in exciting futuristic combat with this second set of Ogre minis, compatible with Ogre Sixth Edition and Ogre Designer's Edition and Ogre Miniatures Set 1! Now you can wage the battles of the Last War on your table top. Containing 85 miniatures, Battle Box has everything you need to play Ogre! This is the ultimate quick reference sheet for experienced players, or an excellent learning tool for newbies! Ogre Miniatures Lite contains the most commonly referenced rules, the Combat Results Table, a handy visual reference guide, tactical advice, and a ruler marked for the unit ranges. And it's a freebie! We do not sell individual blister-packs or loose figures through the distribution chain. Most distributors and stores prefer to carry only the larger boxed sets, and it's just not worthwhile to set up a system for the few stores the would carry individual packs. Sorry about that. We do still have some unpackaged individual Ogre vehicles and figures from our previous line of metal miniatures. These may be purchased through Warehouse 23 while supplies last. 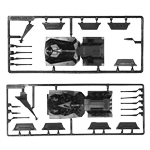 The metal miniatures are generally identical in design and scale to our plastics ones, just . . . umm . . . metal. Available as either the Mark III or Mark V version (or both! ), these never-before-seen Ogres in black reflect the sinister power of the cybernetic tank. Put these on your tabletop and make your Ogre Sixth Edition or Ogre Designer's Edition even more immersive!